Cycle paths at the start of the northern section of the Sutton to Sandycove cycle route were “suspended” for the “safe loading and unloading” of coaches serving recent Bruce Springsteen concerts at Croke Park, Gardai have said. IMAGE: Coaches parking, including one on a cycle path at a toucan crossing for cycling and walking. “Sanction was sought and granted from Dublin City Council for the suspension of the cycle lanes on both nights of these concerts to allow Alfie Byrne Road to be utilised as a drop off and collection point for coaches. This was to allow for the safe loading and unloading of patrons to and from the concerts,” said Sergeant Jim Molloy, at the Garda press office. 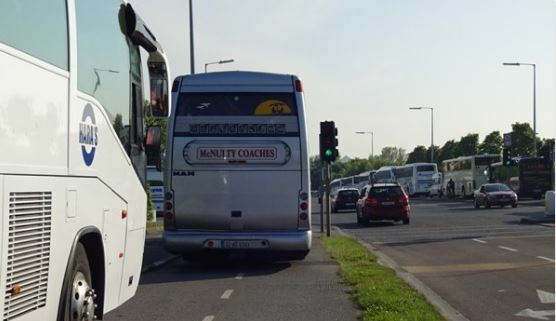 IrishCycle.com contacted the Garda press office after a reader sent us photographs taken a week ago of coach parking on the Alfie Byrne Road. A coach driver who spoke to our reader told him that the parking was sanctioned by the Gardai. The location is over 1km from stadium and is understood to have replaced previous coach parking at the central locations including the historic setting of Mountjoy Square, which was disallowed for coach parking after residents and others objected. Three Twitter users, some using the #freethecyclelanes hashtag, also highlighted coach parking on the cycle paths at Alfie Byrne Road last year on July 24 — a date which corresponds to an Ed Sheeran concert at Croke Park. Coach Tourism and Transport Council of Ireland said that the National Transport Authority should use its powers to provide coach and bus parking facilities at State-owned depots, including Broadstone, Summerhill, Bus Aras and Donnybrook) to private bus and coach operators. It also said that all local authorities, should prioritise coach and bus parking facilities in planning permissions granted for any public amenity. A temporary gain for long term pain. These off-road cycle tracks do not have structural capacity for vehicles, never mind parked coaches! I have no doubt that damage caused by these coaches will lead to failure of the pavement and degradation of ride quality for cyclists. Over time the cycle track will become unusable, the council will not repair it and more cyclists will revert to the road by choice. Cycle lane in vicinity of Bloom in the Park closed to facilitate Car parking! @Tristan – that’s a very salient point. Even private cars will cause significant damage over time. The segregated cycle lane on the Alfie Byrne Rd is very important for a lot of people. Large numbers use it for commuting (including large numbers who work at East Point business park) and at weekends large numbers also use it as part of the S2S cycleway to connect to Clontarf and on towards Sutton & Howth. Willfully allowing it to be damaged shows an extremely short-term view by authorities. The effects of constant vehicular parking on structures not meant for vehicles is seen just around the corner on the East Wall Rd. The footway on the north side of that road has daily vehicle parking on it by cars, vans and trucks. As a result that footway is in a desperate state and is crumbling away in parts. Maybe it’ll take a pedestrian to trip over the lumps of displaced pavement and sue Dublin City Council before they take the issue seriously. A few weeks back, I came across an outfit that were contracted to cut the grass margins along Alfie Byrne Road. Where do you think that their van and trailer were parked ? Yes, that’s right completely on this very cycle track, blocking it entirely. The S2S along Clontarf Road has already suffered subsidence along some stretches. Wonder would this have anything do to with frequent use by vans of Dublin City Council’s Cleansing Dept ? What’s the use of spending all the money and time building these near proper facilities if they continue to be wrecked on this way ? I can’t imagine the same council allocating any further funding to carry out any repairs here. Now if this was a roadway, what would happen ? This report is depressing. All the progress currently underway, not to mention the money being spent, is completely undermined by this type of regressive step. The city should be encouraging walking and cycling to large events, instead DCC is actively working against it. Park and ride facilities are provided at the outskirts of the city. Dublin Bus could do more to connect services for big events, for example dedicated buses to and from the event every 10 minutes for a set time before and after. I was in Edinburgh a few years ago for a match. After the game, the city provided a constant stream of buses to the airport to get fans on their way home. No one looked for tickets and it worked, people got home. If DCC is so keen to provide facilities for coaches, there is ample open space either side of Alfie Byrne Road, to construct a coach park. It would hardly take too much to build, compared to repairing the cycle track. It should even generate some income as I would expect coaches to pay for such convenient parking (compared to parking in the outer suberbs). This location would also serve access to the Aviva and RDS via the Dart line. @Hugh I don’t think there is space around that area. Where exactly are you referring to? The green spaces? Remember all this area is now (2015) a designated UNESCO biosphere reserve and I think any future construction would have to bear that in mind. I think your idea of a park-and-ride with regular shuttle buses is a valid idea. I’ve also experienced such a set-up. I was at a large conference in the States which was attended by thousands. There were two main centers which the event was taking place at. Both centers were separated by a few kilometers, but frequent free shuttle buses between the 2 centers ensured there were no problems with people getting from A to B and back again. No real practical reason why this couldn’t also be done here in Dublin. Also better longer term planning needs to be done by Dub City Council. As pointed out by posters here and elsewhere, there are a number of venues in Dublin which attract very large numbers of people (Croke Park, RDS, Aviva etc) but at which parking is not available. The result on event day is an uncomfortable mess for event-attendees and locals when thousands try to get there by car and coach. Oh, and just to add – the above mentioned locations have just about zero bike parking facilities. Whilst impractical for out-of-town visitors, many thousands of Dublin people could get to these locations if there were safe, secure bike parking. And of course if there was safe cycle-infrastructure to get them there in the first place. Instead of course we have what little bike infrastructure we have being used as vehicle-parks. It would be comical if it weren’t so f-ing stupid. The 12-h QBC lane on Merrion Square N was re-dedicated as a private coach park in 2015 so cyclists are now forced out into the adjacent GVL which is too narrow to permit safe overtaking of cyclists transiting the row of parked coaches. Which Planner consented to this change of use? Did it have the approval of the Transport/Planning SPCs? Where is the road safety audit report for it? Oh and coaches are not permitted to be there after 16:00 h but guess what? It’s not enforced by AGS! Why don’t they let coaches park on the road making it a one way road if there is not enough space for traffic in both directions? I never get why cycle lanes are always sacrificed so cars can continue on their way. @Citizen Wolf, point taken on the UNESCO designation. I wasn’t aware of that. My research was limited to Google Maps. I agree with you on your point about Dublin based event goers. DCC should be encouraging more to go by sustainable modes. They should put pressure on Dublin Bus and Bus Eireann to add extra vehicles to meet the demand. I remember that used to happen for Slane, not sure if they still do. Why has there never been built a railway station at Croke Park? It seems so obvious, with the railway right there. It was raised as a possibility a few times. It is standard in large stadiums in every other European city and it works for Lansdowne Road. So why not Croker? @tdlegge Drumcondra and Connelly serve Croke Park. It is now practice to avoid building train stations very close to large venues for crowd control reasons. And stations unsuitable for large crowds are closed before/after large events (there’s examples of this happening with Tara St and Lansdowne Road stations in recent years).